The Discovery Channel's Shark Week wraps up another record week for viewership and social buzz. 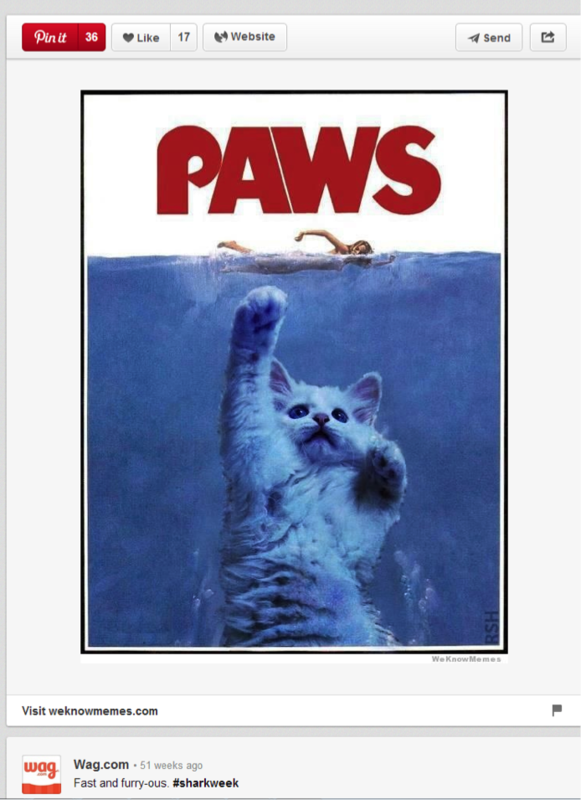 First broadcast on July 17, 1987, this week-long series dedicated to the most feared animals in the ocean is the longest running cable television programming in history. It was originally developed to raise awareness and educate the masses about these fascinating creatures and is now broadcast in over 70 countries. It is also one of the most celebrated weeks of the year across social networks, which is why I thought it would be fun to point out some takeaways for content marketers from a few of the top marketing campaigns. 1. 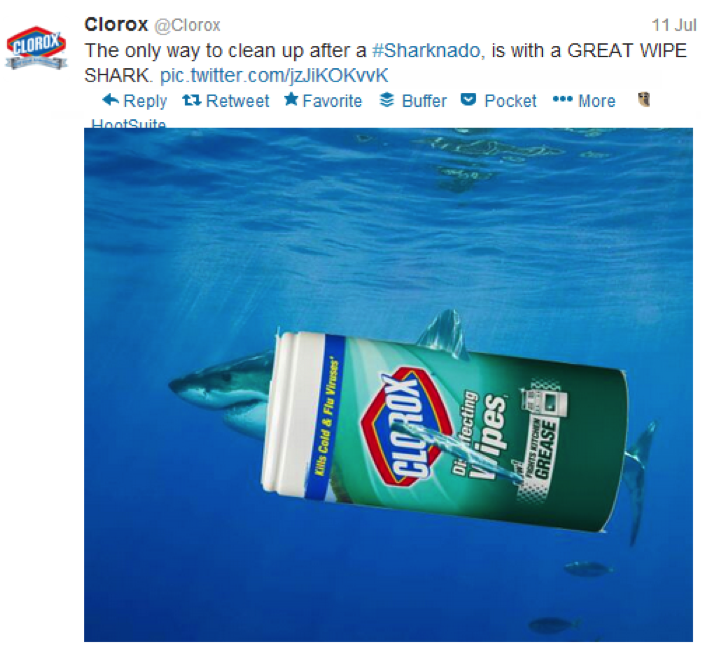 Wittiness is Terribly Underrated: Clorox must have a comedian on their marketing team or just one very clever agency to come up with Great Wipe Shark. I can imagine the brainstorming session that took place around this campaign must have been a blast. 2. Connect with Nostalgia: Nostalgia is a fantastic way to connect on an emotional level with your audience. Used correctly in your content marketing it can evoke emotions of a fuzzy golden heyday of our past and take your audience on a trip down memory lane. Remind them of a piece of pop culture and relate it to something current as Wag.com does so well in this example. Adding the element of cuteness is a bonus as well. 3. Tie it Back to Your Product: What’s the purpose of these fun campaigns if a marketer can’t tie it back to their product? Tide really stepped up to the plate with this fun Vine video it has pinned to its Twitter page all week long. The real genius here is how they seamlessly plug the cleaning power of Tide while entertaining their audience at the same time. 4. Add Some Personality – Even B2B marketers are jumping on this trend. 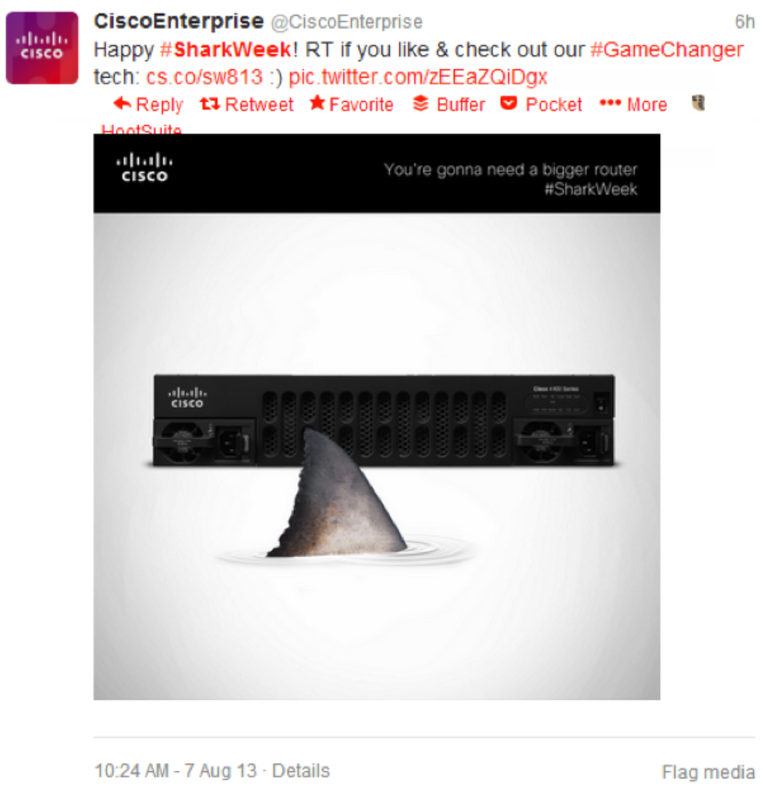 Check out how Cisco added a bit of personality to their #SharkWeek campaigns. This is the type of thing that so many B2B marketers miss out on, humanizing their brand by showcasing a bit of personality. 5. 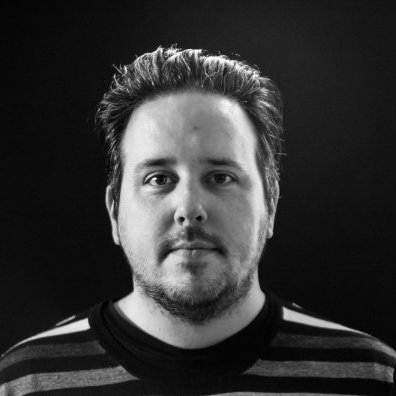 When in Doubt, Build a Top 10: If you build a list, the audience will come. It’s a tried and true content tactic, but one that is consistently almost always a home run for content marketers. Top 5, 10 or even 20 lists are always a hit since they are easily to digest, easily scanned and often fun for your target audience to read. Salesforce puts a clever, and audience-centric, spin on this list featuring the 20 Ways Salespeople are NOT Like Shark Week (thank goodness).